Click to learn about the Maha Kumbh Mela that will be held in Prayag, popularly known as Allahabad, in 2013. The last time, in 2001, when the Maha Kumbh Mela was held here, nearly 60 million took a bath at Sangam, plus thousands others bore witness to the grandness of the event. After 12 long years, the wait is finally over as the Maha Kumbh is once again back to where it belongs – Allahabad. And the Kumbh Mela that is held here is considered to be the largest and holiest of all the four destinations and is believed to be the most auspicious. Allahabad is one of the most sacred cities in India, wherein the purity lies in the belief that after creating the world, Brahma, the great creator offered his first sacrifice at this place; and also because of the important position it holds according to the Hindu scriptures for possessing the holy confluence, known as Triveni Sangam, of the three sacred rivers of India - Ganga, Yamuna, and the mythical Saraswati. In 2013, from 27th January to 25th February, the banks of the Sangam will once again be in an uproar as millions - devout and commoners alike will make the place their temporary homes. And the sight of Sadhus, the guardians of the faith; Naga Babas, covering their naked bodies with ash; and Mahants, lured to come out of their hideouts in forests, mountains, and caves, charging towards the Sangam to take a holy dip in the waters at the appointed time will once again make up for the visual dazzle. It’s believed that bathing here will free one from all the past sins, thereby liberating him from the cycle of life and death. Discomfort of having to travel miles and living open air under freezing weather will take a backseat and it’s the pure sense of devotion and spirituality that will prevail, evident through their faces. Famous for its culture and contemporary heritage, the city of Allahabad will once again become a major attraction for foreigners willing to witness the greatest expression of Indian religion, and study and learn Indian culture as the roots of tradition and customs can be easily traced in this land of Triveni Sangam. 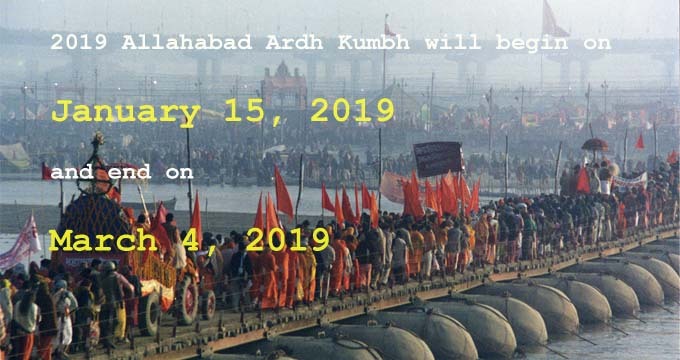 The Maha Kumbh Mela to be held in Allahabad (Prayag) in the year 2013 will commence from 27th of January and will continue till 25th of February.